Last month I had the privilege of pattern testing a new design by Elizabeth Dackson of Don't Call Me Betsy. Elizabeth sent over a draft of her new pattern, Sew Positive, and this is what I whipped up with it. 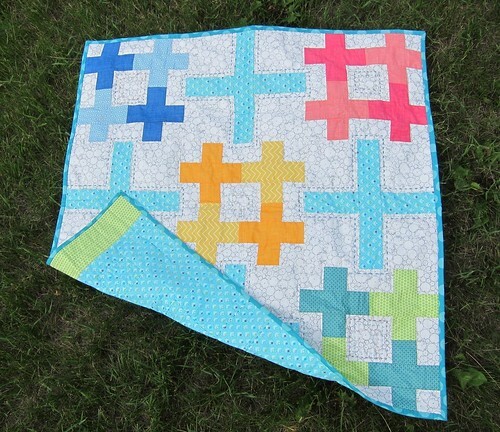 Her design is versatile and gives even brand new quilters the opportunity to try something unique but yet still very achievable. The pattern isn't overly challenging, just requires that you maintain a consistent 1/4 seam allowance. 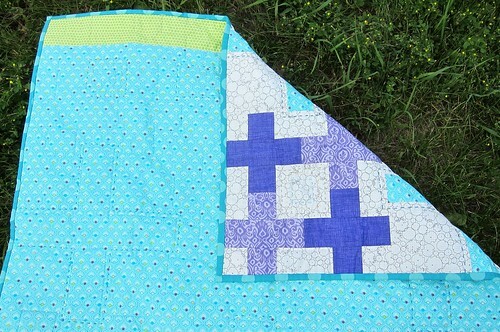 I completed this baby sized quilt top in an afternoon, including pulling fabric from my stash, cutting and piecing it. When quilting this piece, I chose a combination of machine and hand quilting. I used white Aurifil thread to machine stitch around the outside edge of the cluster of four small plus signs (shown in pink in the photo above). I used perle cotton in size 8 to hand stitch 3 boxes in each cluster center, as well as dark teal to stitch around each of the large plus signs. I love the effect it gives on the quilt back. The backing was pieced using the same fabric as the large plus signs on the front, combined with a strip of green dots to edge the top. 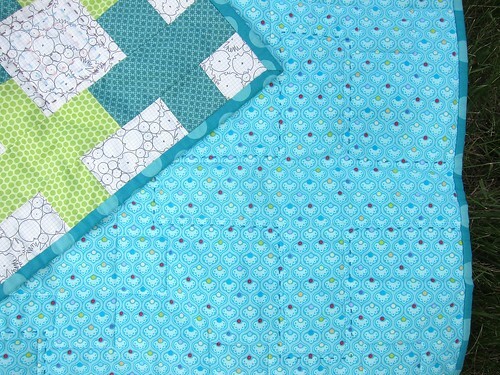 I used a large aqua polka dot print for the binding that helps tie the front and back together. 3. High volume vs low volume prints anyone? Hop on over to Elizabeth's blog today to read more about her Sew Positive Pattern and where you can get your hands on it. This marks my first completed project for the Q3 2013 Finish A-Long - read more about my ambitious finishing goals here. so pretty! 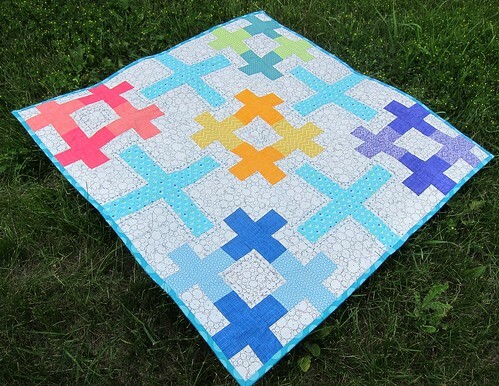 love your color combo and the hand stitching! Hey fellow SewPositive tester. I love the background fabric you chose and those brights. I was also thinking of using colored background with neutral plusses. That would be really fun. I LOVE it Kelsey. So great. The background fabric is perfect! So sweet! I especially love the hand quilting. OMG, Love!!!! Sooo pretty. *sigh* Architextures background could not be more perfect. Just gorgeous. Your colours all look so great against the architextures background! And i love the combination of machine and hand stitching. You're just knockin' these projects out!! Keep it up! This is sooo gorgeous! The Architextures print makes a perfect background for those lovely zingy plusses! cute pattern and cute fabric choices! love it! 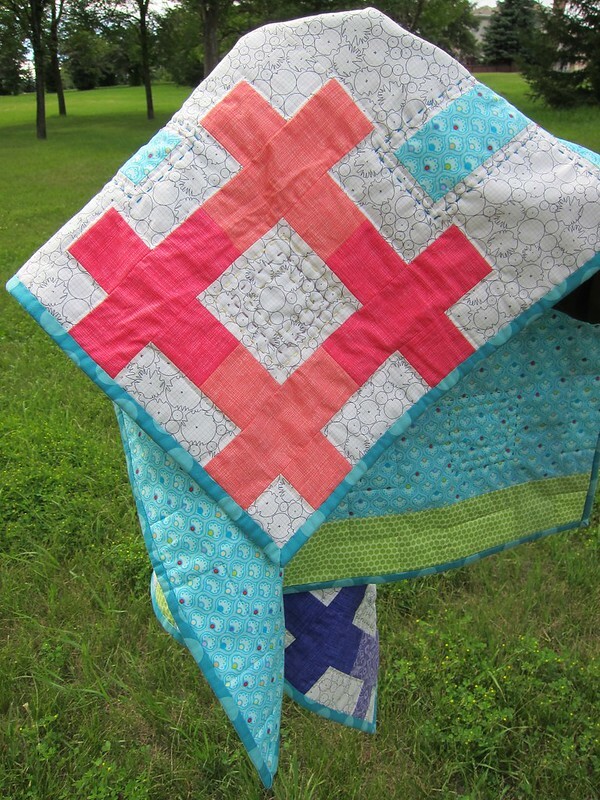 I love the hand quilting! How do you get it so neat on the back? My first foray into hand quilting looked great on the front but iffy on the back. Love everything about this. The background fabric is perfection and the colors are gorgeous. Really nice job!